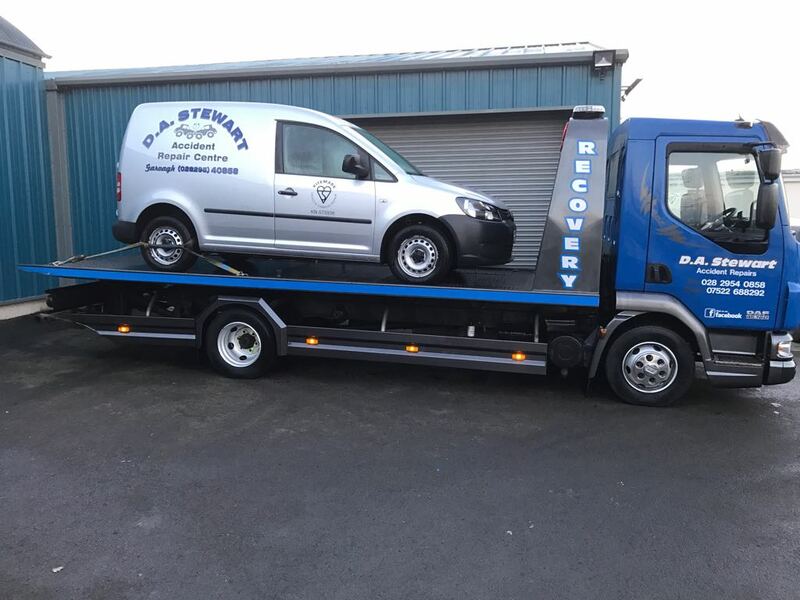 “D.A.Stewart Accident Repairs Ltd. A family run business, established over 40 years and one of the leading vehicle repair centres in Northern Ireland. We are here to take the stress away from an accident. We will help and advise you on all aspects of vehicle repairs, from small dents and scrapes, to reporting a new claim and liaising with your insurance company on your behalf. We can provide road side recovery at the scene of the accident. Our estimator/driver can come out to your home or place of work to assess and collect your vehicle and once your vehicle is in for repairs a courtesy car can be provided if required. Why choose D.A. Stewart Accident Repairs Ltd? With our team of dedicated technicians, you can count on us to offer a professional, reliable and value for money service. Our staff receive continuous training in both body work and mechanical repair. With ATA accreditation in paint, panel, MET and estimating to keep up with the BS 10125 standards. In 2011, we were one of the first accident repair centres in Northern Ireland to achieve the prestigious Kitemark award. We are Kitemark approved and are registered under member no KM 575936. When a car goes in for body repairs, you need to feel confident that the repair is carried out to the highest of standards so that the vehicle not only protects the lives of those on the road, but maintains the pre-crash integrity of the car. A body shop that has the Kitemark for vehicle body repair, means you can feel reassured that what ever the type of repair needed, whether it be cosmetic, a structural repair or involves aluminum and composite bonding, the quality will be as good as it was before the accident happened. Failure of a body shop to adopt the correct repair method could in certain cases seriously affect the vehicle’s integrity in the way it may preform in the event of an accident. Please take a moment to view our Profile on the BSI website. What does the Kitemark Vehicle Body Repair scheme mean for you? Take a look at the video below and find out what can happen with poorly repaired vehicles. © 2019 D.A. Stewart Accident Repairs Ltd.